Sunset Hill Stoneware's production crew are the engine in our well-oiled machine. Without these craftsmen, our products would not be as beautiful or sturdy as they are. Every potter, glazier and handler contributes their talents to making our custom stoneware mugs and steins. Meet Eli Wickman. Aside from being the subject of our employee spotlight this week, Eli is one of our skilled potters who throws hundreds of mugs each week. 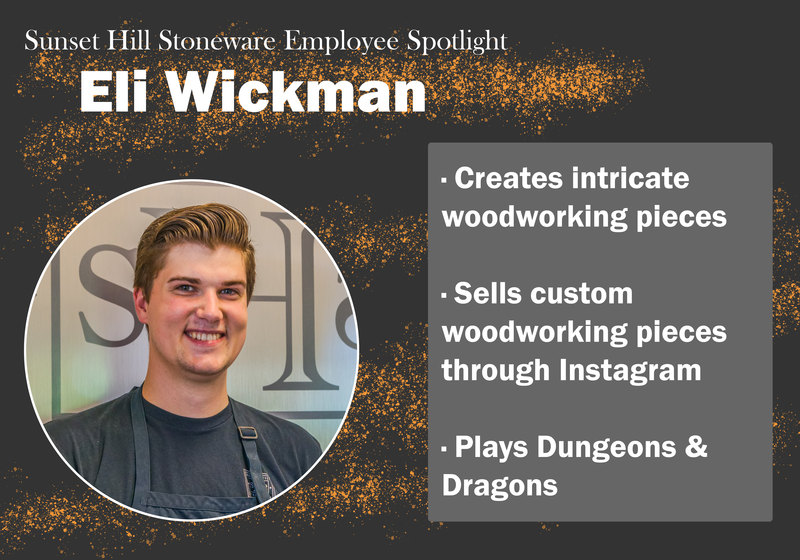 Eli started out at Sunset Hill Stoneware as a temporary employee in our shipping department while another employee was on vacation about two and a half years ago. However, the team liked him so much that they decided to keep him on full time. After two months working in our shipping department, Eli became an apprentice potter to learn the ropes of throwing our mugs, steins and other products. Now, as a full-fledged potter in our production facility, he throws dozens of mugs and steins each day. "I didn't want to not be good at it," Eli said, laughing. "I was given this opportunity and I wanted to... be like, 'Yeah, I can do this.'" However, after he finishes washing the clay from his hands for the day and goes home, Eli gets his hands dirty with something else: sawdust. Woodworking has been Eli's passion for a long time. With his father working in carpentry, he's been around woodworking tools since he was a toddler and learned how to use them from a very young age. Once he got older though, he began to miss being around those things and learned more about woodworking again, largely so he wouldn't have to buy cheap furniture anymore. "I started with a coffee table, then end tables, then bed frames, then headboards that have hundreds of holes drilled in them that shoot out light so it's backlit," Eli said. "And then it just kept on progressing to wall art." It's been four years since Eli first picked up woodworking. There was a bit of a learning curve, but his experience being around his father's tools as a child helped him get through that with relative ease. "All woodworking started off as a bases for a need of some sort," Eli explained. "You need a table, you need a chair. And I think that's true, but it has to say something about you as a person." Much of Eli's woodworking pieces are functional, but also show off more intricate details and designs than what's found in traditional woodworking. He takes pride in showing off his craftsmanship and creating pieces that have the mark of artisan quality. Unlike many woodworkers, Eli likes to make pieces out of plywood. Describing it as "the Frankenstein of wood," he explained that he likes to use it to make intricate designs out of wood that nobody would have spared a second glance. "All of the sudden, this throwaway garbage base wood is this beautiful piece because it's used differently. "I like highlighting the beauty in garbage, I guess," Eli added, laughing. One of his favorite things about woodworking is that it's not an activity that can be done passively. Because he's working with sharp tools and spinning blades that could potentially take off all of his fingers, it's important to be totally mindful and focused on where he is. He doesn't even have to put on music while he's working. "If I have a bad day or I'm stressed or if something went wrong, I can just go down into my workshop and use my handsaw to really cut the perfect dovetail and watch the pin go right into the slot and just perfectly work," Eli said. "You actually get tangible results of your hard work." 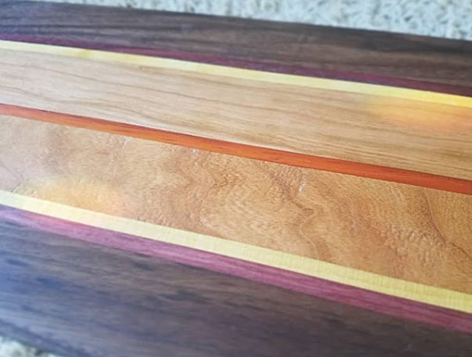 Eli has made scores of pieces since he began woodworking, but he says one of his proudest pieces is a headboard he created for his wife and himself before they were married. He had been looking to simply purchase one online, but since headboards are expensive and not particularly unique in their design, he decided to try making one himself to surprise his wife while she was out for the weekend. The headboard has symmetrical rows of holes, which start out large and shrink further away from the center, creating the illusion that the headboard is bent. When the light behind the headboard is on, the holes help create a sunset effect in the rest of the room for peaceful, ambient lighting. It took Eli a long time to create this headboard, but it stands as his favorite piece because he managed to create that without a drill bit. 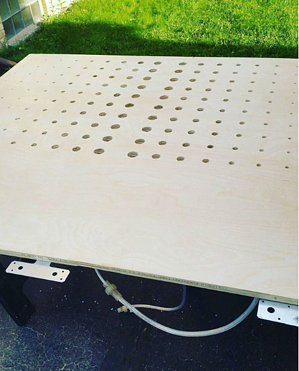 He used his great-grandfather's hand drill to create hundreds of holes in different sizes. "It has all of my blood, sweat and tears, and it turned out to be something that my wife loves," Eli said. He has replicated another version of this headboard for a few other people, but he's never done it the same way. It's truly one of a kind. At any given time, Eli has multiple projects going on for different clients. 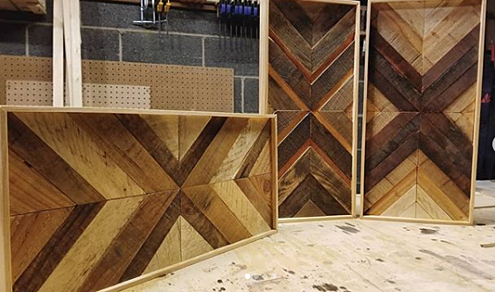 At the time of his interview, he was working on several triangle shelves, a headboard that had shelves and a houseful of window shutters made out of pallet wood. In addition to his woodworking pastime, Eli is also involved in a podcast on the side and regularly participates in a Dungeons & Dragons group. Eli's official Instagram page for his woodworking can be found here.